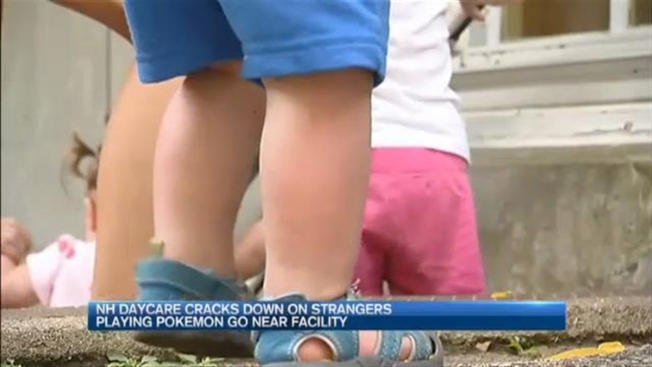 A popular Pokemon Go gym is taken out of the game in Portsmouth, New Hampshire, after day care workers complained that strangers were getting too close to the children's playground. It's the last thing Dover mom Kelly Emerson expected to see at her son's day care. "It kind of scares me," Emerson said. "You don't know who they are, and where they're from or what they're doing." Turns out, the suspicious people were playing Pokemon Go and Little Blessings Child Care Center was a hot spot. Couture is a Pokemon Go player, but also an employee at Little Blessings. She says the children's safety is far more important than any PokeStop. “We really don't want strangers walking around our premises where there are children under the age of five playing,” Couture said. So she and other employees started asking the trainers to leave. “It's not the best place, there are plenty of other places they can go,” Couture said. Meanwhile, Little Blessings Director Diane Lewis reached out to the game's developer, Niantic Labs. Within two weeks, they did. “It was a big relief,” Lewis said. “I think it's great that we actually got a response,” Couture said. And while Emerson isn't opposed to the game itself, there's peace of mind knowing the nearest Pokemon Gym is now far away from Isaiah's day care. “Relieved I don't have to come in or see anyone driving in just sitting there,” she said. Couture tells us there are plenty of other places in the city people can go play. Portsmouth police say they understand the concerns at the day care, but say they haven't had any trouble with Pokemon Go players - other than some people walking into traffic streets without looking up from their phones.